This article is about occupations. For the biblical figure, see Job (biblical figure). For other uses, see Job (disambiguation). A person's job is their role in society. A job is an activity, often regular and often performed in exchange for payment. Many people have multiple jobs, such as those of parent, homemaker, and employee. A person can begin a job by becoming an employee, volunteering, starting a business, or becoming a parent. The duration of a job may range from an hour (in the case of odd jobs) to a lifetime (in the case of some judges). 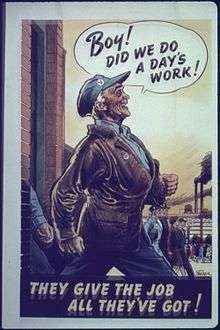 An activity that requires a person's mental or physical effort is work (as in "a day's work"). If a person is trained for a certain type of job, they may have a profession. The series of jobs a person holds in their life is their career. Most people spend up to forty, or more hours each week in paid employment. Some exceptions are children, those who are retired, and people with certain types of disability, but within these groups many will work part-time or occasionally, will work in one or more volunteer positions, or will work as a homemaker. From the age of 5 or so, many children's primary role in society—and therefore their 'job'—is to learn and study as a student. The expression day job is often used for a job one works in to make ends meet while performing low-paying (or non-paying) work in their preferred vocation. Archetypal examples of this are the woman who works as a waitress (her day job) while she tries to become an actress, and the professional athlete who works as a laborer in the off season because he is currently only able to make the roster of a semi-professional team. Manual work seems to shorten the lifespan. High rank (a higher position at the pecking order) has a positive effect. Professions that cause anxiety have a direct negative impact on health and lifespan. Some data are more complex to interpret due to the various reasons of long life expectancy; thus skilled professionals, employees with secure jobs and low anxiety occupants may live a long life for variant reasons. The more positive characteristics a job has, the more it attributes on a longer lifespan. Gender, country and actual (what statistics reveal, not what people believe) danger are also notable parameters. ↑ Afsara, Mahi. "চাকরী খোঁজার আগে - Before Job Search". Newspaper1971.com. Newspaper1971 Magazine, Bangladesh. Retrieved 24 April 2016.